Jack Lemmon and Walter Matthau are The Odd Couple ... say no more. Neil Simon has a special genius for finding the great hilarity in ordinary people doing everyday things. Like two divorced men who decide to share a New York apartment. That's the premise of The Odd Couple, though there's nothing odd in the casting of two Oscar-winning talents like Jack Lemmon and Walter Matthau. The two veteran funnymen work together with the precision timing of a vaudeville team, but always with bright spontaneity. Lemmon plays fussy Felix, fastidious to a fault. He proves that cleanliness is next to insanity. Matthau is Oscar, who wreaks havoc on a tidy room with the speed and thoroughness of a tornado. An enduring and endearing picture, with the intelligence one usually misses in comedies. Many movies have been adapted into TV shows, but few have been genuinely successful in this regard. M*A*S*H stands as the champion in this regard; not only did the show live up to the film, but it probably exceeded it as it ultimately became one of the most popular and acclaimed TV programs in history. The Odd Couple never achieved the success of M*A*S*H, but some people think of it as the better TV show. Actually, it’s hard to compare the two simply because M*A*S*H aired for so many more years than did The Odd Couple; the latter managed a five-year stint while M*A*S*H stuck it out for a whopping 11 years. Inevitably the quality decreases with that length of a run, so it’d be more appropriate to compare the two in a briefer period of time. In any case, The Odd Couple made for a terrific show. I’d always thought the TV program bettered the 1968 movie, but since it’d been quite a long time since I saw the latter, I was curious to watch it again and determine if my opinion changed. Nope. The TV version of Couple remains the perfect rendition of the story, mainly due to the performances of its stars. Yes, Tony Randall and Jack Klugman seem to have an unfair advantage since I grew up with them as Felix and Oscar, respectively. However, just because I’m accustomed to certain performers in various roles doesn’t mean that I can’t change my mind. For instance, I thought Roger Moore was the best Bond for quite some time before I realized the idiocy of my ways and changed my vote to Sean Connery. However, nothing that I saw in the film version of Couple gave me reason to alter my opinion: Randall and Klugman are it. If one wanted to argue about it, you’d have a better shot championing the virtues of Walter Matthau’s Oscar, as it’s a much closer competition between him and Klugman. Actually, Matthau probably offers the better portrayal of the role; his laissez faire attitude seems a little more convincing and he makes Oscar less of a grouch. Klugman could over-emote at times and demonstrate inappropriate histrionics as Oscar. However, his chemistry with Randall was outstanding, so that’s why he remains my choice. As for Randall and Jack Lemmon’s Felix, there is no comparison. Lemmon is a terrific actor but I didn’t care for his spin on the character. Frankly, he made Felix much too aggressive and unlikable. Granted, Felix can be awfully annoying and hard to embrace, but there need to be some redeeming characteristics at work. I didn’t see that in Lemmon’s performance; he creates an irritating jerk who seemed much too strident. Randall excelled for a number of reasons. First of all, he made all of Felix’s quirks appear natural, and we saw a range of emotions in the character. Yes, Felix was and always will be a caricature, but Randall brought out the humanity in the role. We loved his Felix in spite of his behavior. Randall’s impeccable comic timing didn’t hurt either, and Felix works better as a martyr than as an abrasive nuisance. As much as you want to swat Randall’s Felix, you could always empathize with him to a degree, and Randall really know how to push the character’s buttons in just the right proportions. My strong preference for the TV edition of Couple aside, I still find the film to be a mildly interesting experience. It’s a fairly witty flick that has held up reasonably well over the years. However, I really find it tough to get beyond my fondness for the TV show. I continually thought how much better it would execute gags, and how much funnier the acting would be. As such, I don’t know how objective I can be about The Odd Couple. I grew up watching the TV show, and as I’ve learned through continued reruns and the DVDs, I still think it’s a fantastic piece of work. The movie provided able groundwork for it but simply doesn’t stand up well in comparison with the TV series’ delights. 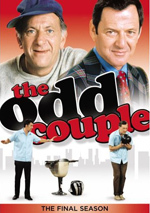 I enjoyed the time I spent with the movie of The Odd Couple but still would rather have watched the TV show. One trivia note: only two actors continued their roles from the movie into the TV series. That would be the Pigeon sisters, played by Monica Evans and Carole Shelley. However, they weren’t the only performers from the film to appear on the show; John Fiedler - the movie’s Vinnie - also made two separate appearances on the series as different characters. 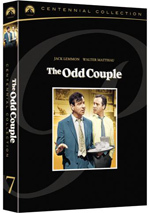 The Odd Couple appears in an aspect ratio of approximately 2.35:1 on this single-sided, double-layered DVD; the image has been enhanced for 16X9 televisions. While not stellar, the transfer usually seemed satisfying. For the most part, the movie exhibited positive sharpness. Wide shots could be a bit soft, though, as the presentation exhibited some tentative delineation at times. Nonetheless, the flick usually looked reasonably well-defined and concise. No issues with jagged edges or shimmering occurred, but light edge enhancement could be seen during parts of the movie. Source flaws remained minor. I witnessed occasional examples of small specks and a tiny hair or two but nothing more intense than that. Grain appeared appropriate and not excessive. The Odd Couple generally used a fairly restricted palette, primarily because so much of it took place in Oscar’s dingy apartment. This meant a set of colors without pop much of the time, which was fine given the visual design. When given the chance – such as during the scene at the go-go club – the hues presented nice vivacity. Black levels seemed fairly deep and rich, while shadows demonstrated good clarity. The softness and smattering of defects left this as a “B-“, but it’s a perfectly acceptable presentation. I felt reasonably impressed with the film’s remixed Dolby Digital 5.1 soundtrack. This came from the original monaural mix and it provided a nice auditory experience. The soundfield demonstrated a definite bias toward the forward channels. Sound spread modestly to the sides, mainly due to the stereo score. I also heard some evidence of effects from the right and left speakers, and the package blended together in a quiet but efficient manner. The surrounds provided almost no noticeable audio. At most they offered gentle reinforcement of effects and music, but for all intents and purposes, they didn’t exist. Audio quality seemed dated but good. Dialogue sounded reasonably natural and distinct, and speech largely lacked evidence of edginess or problems related to intelligibility. When the actors left the confines of the interior sets - which was rare - the lines could sound rougher, but these instances caused no major concerns. Effects seemed slightly thin but came across as acceptably realistic and clear, and the score was nicely rich and bright. At times the music seemed somewhat harsh, but as a whole it seemed clean and vivid. Make no mistake: the soundtrack to The Odd Couple showed its age. However, for a 41-year-old track, it worked surprisingly well. How did the picture and audio of this 2009 “Centennial Collection Edition” compare to those of the release from 2000? I thought both offered identical 5.1 audio, but the 2009 disc demonstrated visual improvements. The new version exhibited somewhat tighter definition, decreased levels of edge haloes, and reduced evidence of print defects. The new transfer came with its problems, but it provided noticeable improvements when compared to its predecessor. Note that this disc loses the original English monaural soundtrack found on the original DVD. While I like the 5.1 remix, I still think it’s a shame that Paramount failed to include the movie’s theatrical audio. While the original DVD included only the film’s trailer - which also appears here – this 2009 version throws in a bunch of additional extras. On DVD One, we get an audio commentary with actors’ sons Chris Lemmon and Charlie Matthau. Both sit together for this running, screen-specific conversation. They discuss memories of their famous fathers as well as observations about the film. In theory, this sounds like a fun commentary. In reality, it proves only fitfully compelling. While they provide occasional into their dads and the friendship they shared, they also often tell us little more than what they like about the movie. The track doesn’t flop, but it rarely offers enough depth to make it a winner. The rest of the components appear on DVD Two. In the Beginning… goes for 17 minutes, one seconds and includes remarks from Chris Lemmon, Charlie Matthau, talk show host Larry King, Broadway revival actor Brad Garrett, director Gene Saks, former studio head Robert Evans, and actors David Sheiner and Carole Shelley. We learn of the project’s roots and development as well as script and story, and the film’s leads. For the most part, “Beginning” provides another ode to Jack Lemmon and Walter Matthau. Other details seem rudimentary at best, so they tell us little about the production. Instead, we’re told how wonderful Lemmon and Matthau were. Despite a few interesting stories, this gets tiresome and means that the featurette fails to prove very informative. Next comes the 19-minute and six-second Inside The Odd Couple. It features Evans, Saks, Sheiner, Garrett, Charlie Matthau, Shelley, Charlie Matthau, and Chris Lemmon. “Inside” examines casting and crew, rehearsals, supporting characters and performances, and reflections on favorite scenes. “Inside” rebounds after the fluffy “Beginning”, though it still provides a fair amount of praise. Nonetheless, it throws in a mix of good details. With Memories from the Set, we find 10 minutes and 24 seconds of comments from Saks and Sheiner. As implied by the title, “Memories” mostly consists of anecdotes from the production. Most of these concentrate on the lead actors, and we get a nice mix of tales about their work. We get more from the actors via the 10-minute and 35-second Matthau and Lemmon. It provides notes from Chris Lemmon, Charlie Matthau, Shelley, Sheiner, King, and Evans. Once again, we get memories of the film’s lead actors. Many of these repeat from the commentary, but we do get some decent insights into the relationship between the actors’ sons. For the final featurette, we locate The Odd Couple: A Classic. It fills three minutes and two seconds with info from Shelley, Chris Lemmon, Sheiner, King, Garrett, Saks and Evans. They all reflect on the film’s greatness. It’s a short and not particularly interesting piece. Under Galleries, we get photos broken into two subdomains. The disc looks at “Production” (27 shots) and “The Movie” (29). Nothing particularly memorable appears in the second area, but “Production” includes a good collection of images. One quibble: subtitles would be nice so we can identify all the participants. Finally, the set includes a booklet. The eight-page piece provides some short production notes and a few photos. It’s not memorable but it’s a nice way to finish the set. One minor gripe: the main menus for both DVDs One and Two feature some generic Odd Couple style music. I don’t believe we ever hear the tune in the film, and I find it strange that the menus don’t use the iconic theme. Perhaps it was a question of money, but the bland song played here gives the package a bargain basement feel. 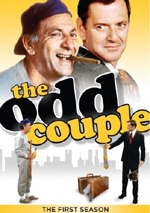 Frankly, I found the movie of The Odd Couple interesting mainly as a curiosity. My affection for the TV show on which it was based remains very strong, which makes it difficult for me to see much of value from the film; I think the TV series outdid it in almost every way. Nonetheless, Couple is a generally witty and interesting feature. The DVD offered reasonably good picture and sound along with an average collection of extras. 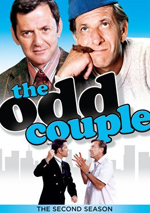 Because it improves on the prior DVD, this “Centennial Collection” of The Odd Couple is worth a double dip for fans, but it’s not a great release.